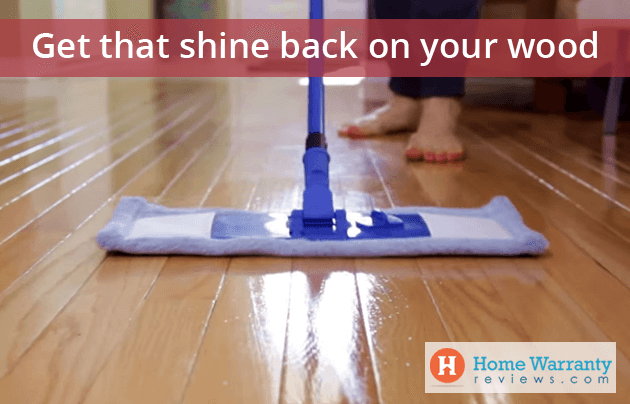 Homemade floor cleaners are definitely a better option when compared to readymade mopping solutions. You can customize your homemade solution to suit the texture of your floors. Readymade solutions are made for floors in general, it may work well on some floors, may not work on others. Ingredients that work well and remove stains on ceramic tiles may not work well on wooden floors. 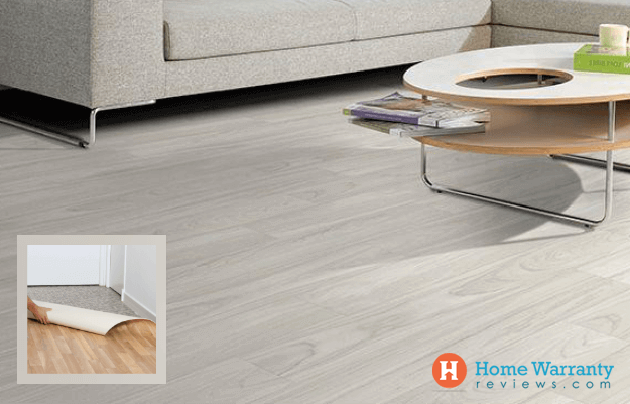 Why Use Natural Home Cleaners for Your Floors? 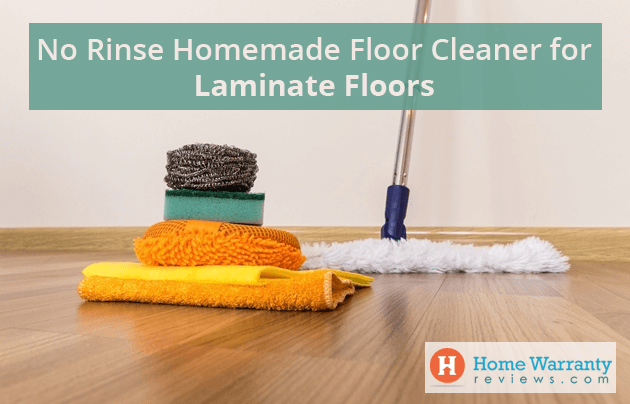 Before I tell you how to make homemade floor cleaners, let me explain to you why you should use homemade floor cleaners. The insides of homes are said to contain 2-5 times the amount of common chemical pollutants when compared to areas outside homes, according to the Environmental Protection Agency. Household products that are made from synthetic substances contain chemicals that are harmful, they react with the ozone from the air and create toxins like formaldehyde. Majority people spend more time at home when compared to any place else. The dense concentration of chemicals can cause flu-like symptoms, headaches, neurological issues and also increase the risk of respiratory diseases. Natural cleaning agents provide you with a safe alternative that encourages a healthy lifestyle. Since natural products and green products generally cost more than synthetic ones, you could make homemade cleaning agents. 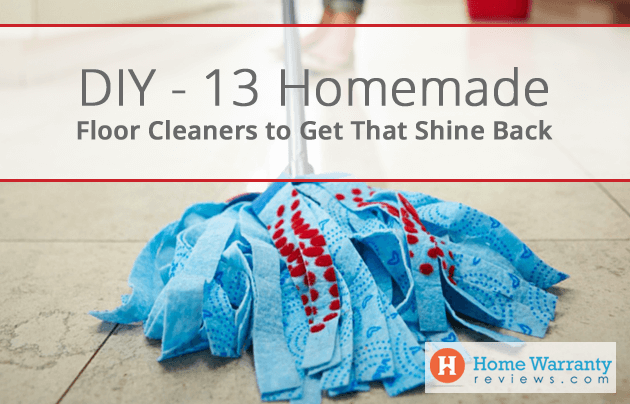 The best part about homemade cleaners is that you can customize them to suit your home’s needs. Vinegar is a common ingredient in most homemade cleaning agents. However, its properties do not always work well with wood and stone floors. Vinegar can cause scratches on marble and granite and strip wood. The below three homemade floor cleaners do not contain vinegar as an ingredient and all of them don’t require rinsing. This cleaner is best for hardwood floors, it even works as a polish. 1 gallon of hot water, ¾ cup of olive oil, and ½ cup lemon juice. This is also a no-rinse floor cleaner. The lemon juice and hot water clean the floor while the olive oil gives it a natural shine. This cleaner is especially good for bathrooms and other areas of the home that require a regular disinfecting. 1 gallon of hot water and ¼ cup of Borax. Even this is a no-rinse floor cleaner. Borax is an agent that can clean some of the worst messes. You can use this solution for all floor types. 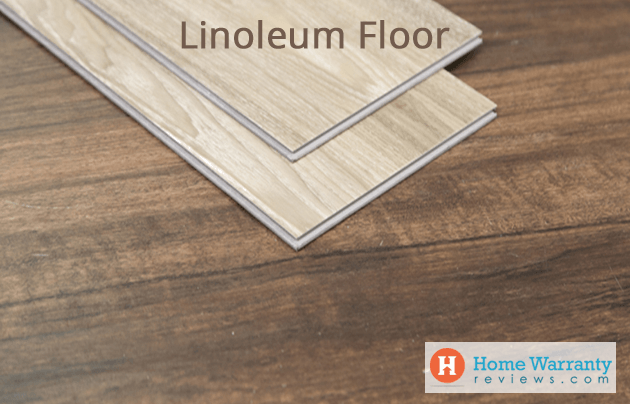 You don’t need to worry about your marble or hardwood floors with this one. Castile soap is made from vegetable oils. ¼ cup liquid Castile soap and 2 gallons of water. Mix the ingredients in a bucket and use the solution to mop the floor. Vinegar has the properties to remove dirt and even clean stains. It is a common ingredient in the majority of homemade cleans, especially floor cleaners and homemade carpet stain removers. 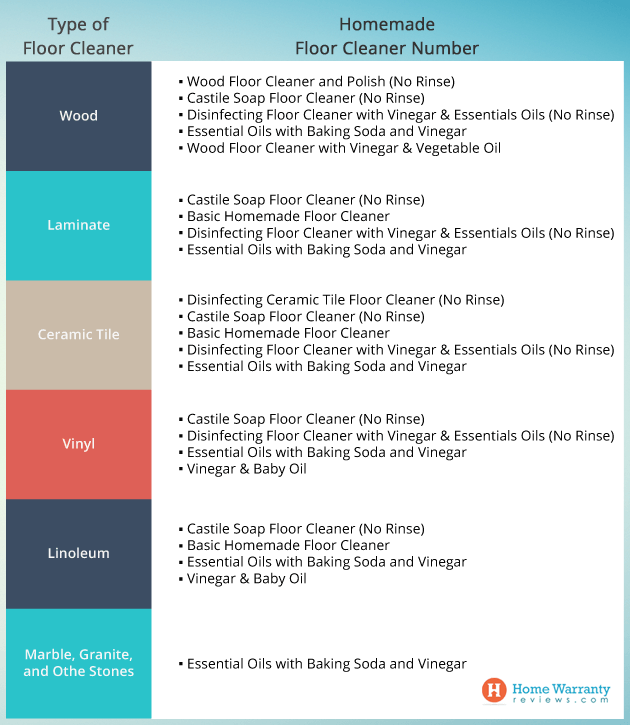 Here are a number of DIY floor cleaners that include vinegar as an ingredient. This is a no-rinse floor cleaner that can be used on a regular basis for all types of floors – tile, laminate, linoleum and sealed wood. White vinegar and hot water. The vinegar acts as a mild disinfectant and leaves your floor shining. 1 ? cups baking soda, 2 tablespoons of distilled white vinegar, and a spray model. Important: Don’t forget to rinse it thoroughly. Baking soda can leave stains that are tricky to remove. 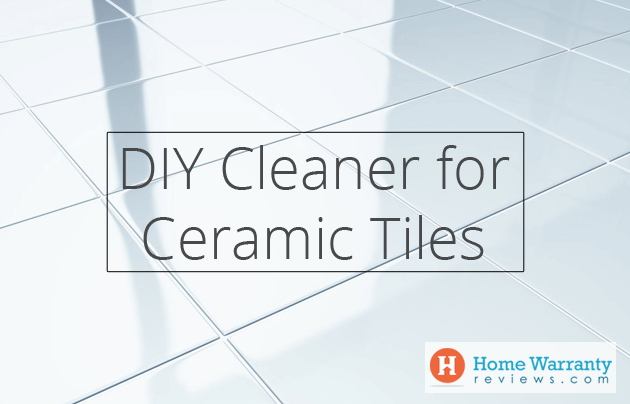 This solution works well for ceramic tiles, vinyl, laminate as well as hardwood floors. The vinegar acts as a disinfectant and the essential oils mask the vinegar smell and give the room a nice fragrance. This can be used for all floor types including stone, granite, and marble. ½ cup white vinegar, ½ cup rubbing alcohol/vodka, 2 tablespoons liquid dishwash, and 15 drops of essential oil (a fragrance of your choice). Scents like lavender and vanilla are associated with happiness. Citric aromas give the place a fresh sense. Mix the ingredients and use it to clean the floor with the help of a mop. The baking soda helps to deodorize, disinfect and scrub the floor. The essential oils mask the smell of the vinegar and give the room a fresh vibe. You could start with maybe 4-5 drops of essential oil and see how it works on your floor. If you like the smell you could add a few more drops. ¼ cup liquid Castile soap, 2 gallons water, ¼ cup distilled white vinegar. Castile soap comes in a variety of scents, you can use a fragrance that you like to infuse a subtle fragrance to your home. ½ cup white vinegar, 1 teaspoon vegetable oil, and 1 cup water. You could also use equal parts of vinegar and vegetable oil. Baby oil can be used to clean linoleum or Vinyl floors. 1 cup vinegar, 3 drops baby oil, and 1-gallon warm water. The ingredients used are specially meant for garage floor that have grease and oil stains. Washing soda, oil, and water. 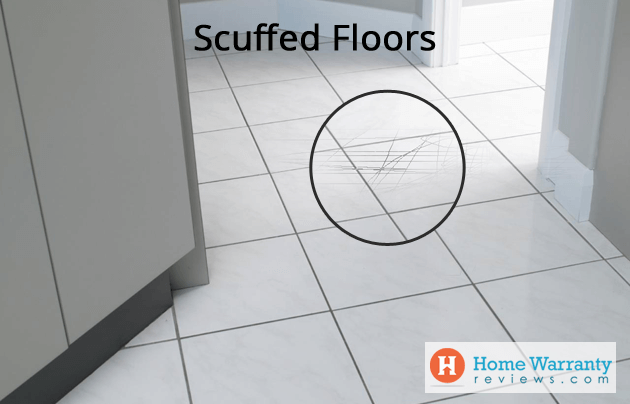 This homemade floor cleaner is capable of removing scuff marks from floors. Tea-tree oil, distilled white vinegar, and a cloth. 4 tablespoons vinegar, 2 teaspoons Borax, ¼ teaspoon liquid Castile soap, and 3 cups hot water. Wipe the floor with the solution and rub stains gently to remove them. Home warranty policies cover the repair and replacements of a range of home systems and everyday appliances. You can extend your policy and include flooring and roofing as well. Flooring includes replacing the portion of the floor that has been damaged or the tiles that have scratches. If you want to know how much a home warranty policy for your home will cost, you can use a home maintenance calculator. The calculator also gives you an estimate of how much your maintenance expenses would come up to without a policy. It is important to know a few things about home warranty before you invest in a home warranty policy. Make sure to research and read reviews about different home warranty companies. The best part about buying a policy is that you get peace of mind with it.